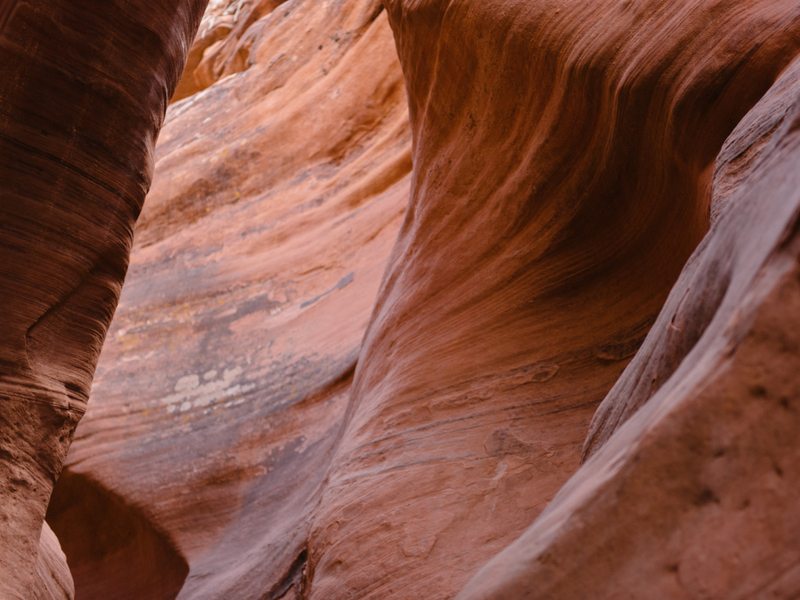 One of the truly classic hikes in the United States, let alone the world, Buckskin Gulch swerves through a subterranean paradise for the senses. Attempt this visually-arresting walk as a day trip, or walk the entire 20-mile stretch over the course of four days. Located in the Grand Staircase-Escalante National Monument (Utah) and Paria Canyon-Vermillion Cliffs Wilderness (Arizona), Buckskin Gulch takes hikers through the veritable layer cake of the Colorado Plateau's geographical wonderment. 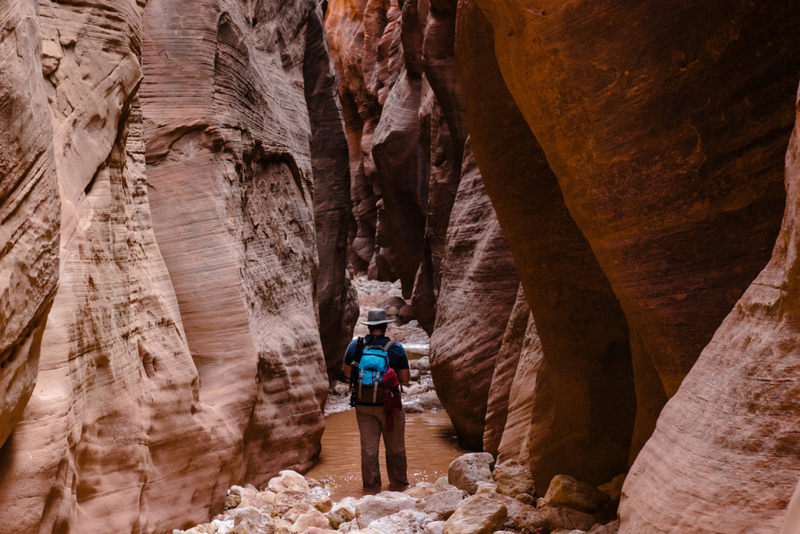 It is the longest and deepest slot canyon in the Southwest and offers obstacles like rock jams, pools, quicksand, and the potential for flash floods. Yet a day hike option via Wire Pass is moderately easy, and should be a must-do on any hiker's list. 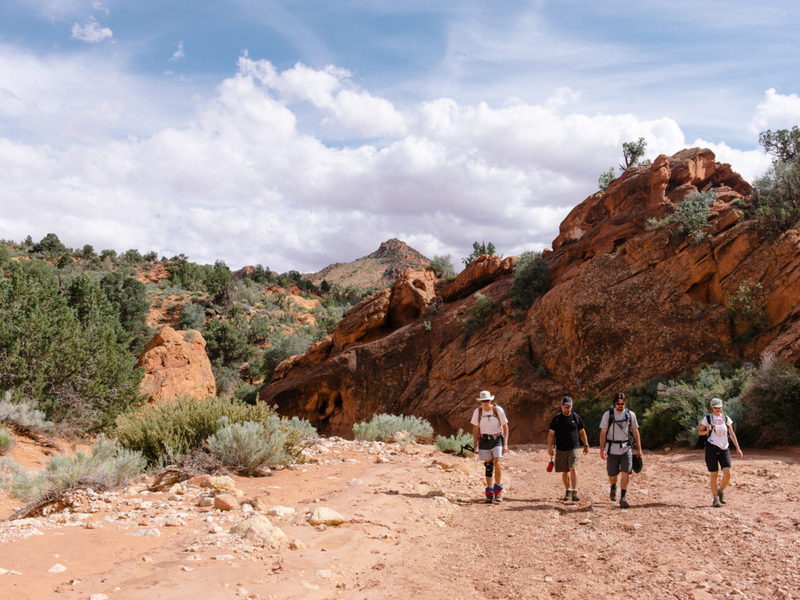 The day hike from Wire Pass, a short tributary to Buckskin Gulch and the most scenic and direct way into the classic narrows, is an ideal alternative to the multi-day backpacking trip. 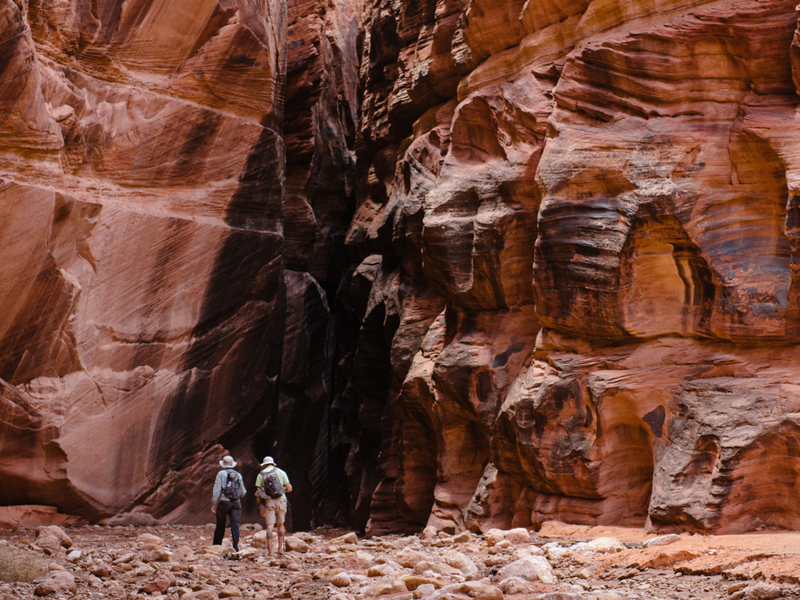 You will plunge right into the Buckskin squeeze, where the canyon is rarely more than 10 feet wide and the corridor can be hundreds of feet deep. With stone so deep it’s a challenge to see blue skies in places, this hike will be something that you remember forever. Via the Wire Pass trailhead, the hike is simple, walkable, and pleasant. Depending on the time of year, cold knee-deep pools of water or large swaths of mud will persist along the hike and must be forded. There are also a few areas that need to be ascended/descended that are easily manageable, but might make the faint of heart consider turning around; these are climbable sections that are only a few feet at the drop. After you leave the trailhead, you’ll follow a wash to the entrance of the canyon at 1.3 miles in. 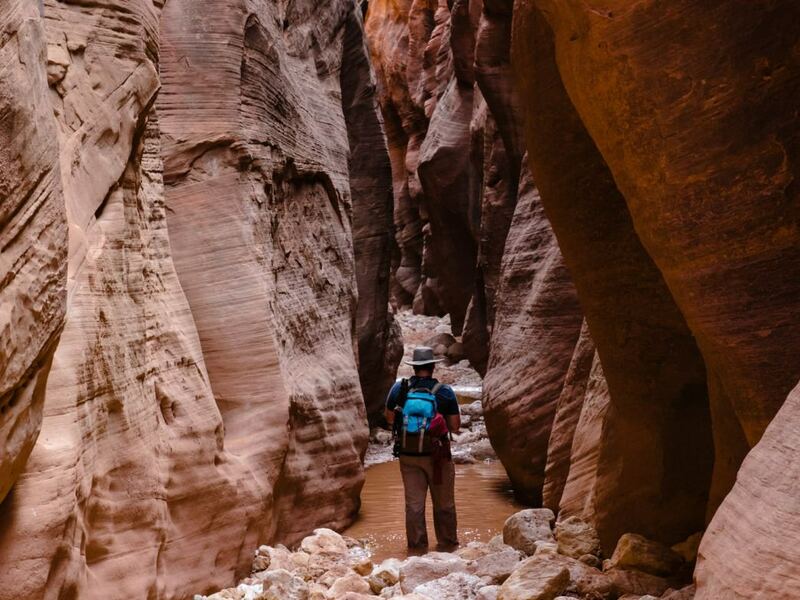 The sandstone walls will confine and open up several times as you traverse to the confluence with Buckskin Gulch at 1.75 miles. There is a petroglyph at the base of the large alcove on the right. You can continue up Buckskin Gulch for as long as time will allow. And when you plan your trip, make sure to buffer lots of extra time for photography—you will need it. The dramatic, picturesque Navajo sandstone illuminated by indirect sunlight, thereby bringing out the quintessential hues of red rock country; how the curves of the rock have been smoothed by thousands of flash floods over time; the towering walls that, at certain points during the hike, lovingly squeeze in on you. Anyone with a bucket list of the best hikes in America or anyone who will soon make a bucket list of the best hikes in America. Park at the Wire Pass trailhead and follow the trail to Wire Pass. Permits are required for day hiking ($6) and overnight backpacking ($5). These can be obtained online or in the Bureau of Land Management office in Kanab. Day hike permits can be also obtained at the trailhead. 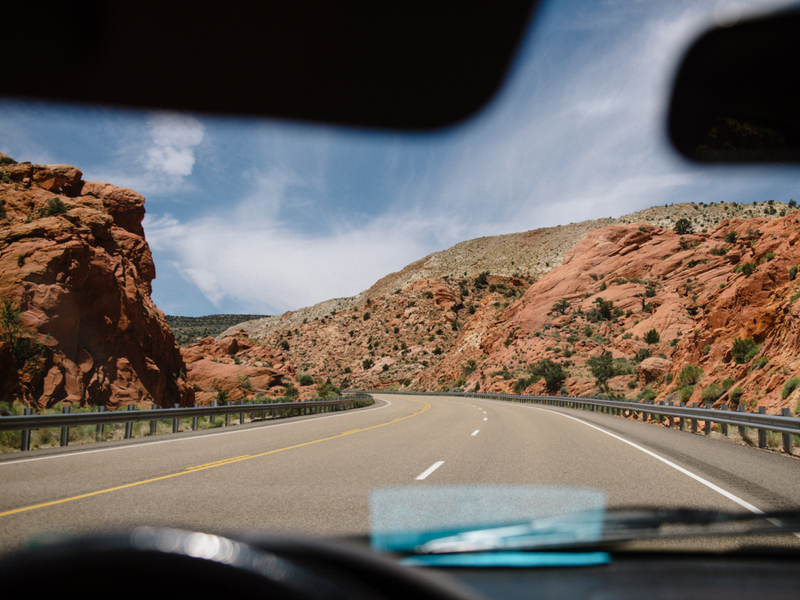 There is a limited number of overnight permits available per day, and these can sell out up to months in advance. Dogs are allowed, but there is a $5 fee per dog. Do this hike from April to June or September to October; during July and August, the chances for flash floods increase. All slot canyons are inherently dangerous for flash floods potential, so check the forecast before you hike.